This Egg is extremely easy to find, but its not obvious that its really an Egg at first. If you watch the main menu screen on either of the 2 discs, you will notice a small dog piss on silent bob. This is nothing special, except that it happens at exactly 37 seconds. 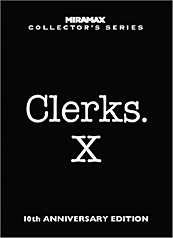 This is a reference the original Clerks movie of '94.